Bunnomatic coffee makers that are suitable for you? What Machine Can You Get From Bunnomatic? The Bunnomatic or Bunn-O-Matic is a company that designs and manufactures home coffee brewers and commercial beverage equipments. Because of their dedication to provide high quality products that the consumers needs, they were recognized as the top leading producer of coffee makers and other household equipments. From coffee makers to coffee grinders, to thermal servers, to coffee machine’s accessories that the customers’ needs, the company continue to produce innovative products. They were able to provide all the possible products that the people needs in their daily lives. Bunnomatic (the office company for Bunn) was founded in year 1957 and they are located in Springfield Illinois. Bunn-O-Matic also has plants, sales offices, and ware houses. Their plants and warehouse is located in Mexico, Canada, and metro area of New York, Iowa, Illinois, California, and United Kingdom. The offices sales of the company is also located in Europe, United States, and Asia . The four popular home based machine of Bunn-O-Matic are the NHB Brewer, the BX Brewer, the GR Brewer and the My Cafe Brewer. Bunn NHB Brewer is somewhat like a commercial automatic drip brewer that many coffee shops are using. The features of this coffee machine are the following: it can brew up to 10 cups of coffee within 3 minutes, has a hot water reservoir, internal thermostat, stainless steel inner tank with heater (800 watts), custom sprayhead, and has sliding lid for adding water. NHB is said to be durable and it is porcelain-coated. This coffee machine has a dimension of 8 ½” x 13 ½” x 11 ¼” and is also subjected to 3 year limited warranty. Step up to the quality and its renowned performance with the Bunn BX coffee brewer. This coffee brewer can brew a maximum of 10 cups of coffee within 3 minutes. This machine has these following features that you will surely love. These features include simple controls, durable construction, hot plate, stainless steel boiler, and advanced spray head water diffuser. When you do buy this machine, a manual is included for you to be guided on proper installation of its parts. GR brewer is another product model of Bunnomatic. Like the other coffee brewers stated above, GR brewer has its own interesting and unique features. Its features are the following: it has a hot water reservoir-style broiler, it has convenient close-brew lid, it can brew up to 10 cups of coffee in just 3 minutes, has an internal thermostat, sprayhead design, has a vacation switch, and it has a decanter that holds up to 50 ounces. Bunn-O-Matic My Café home brewer is one of the most popular models of the said company. My Café brewer is a commercial quality system that has the ability to brew both coffee and tea. It is compatible with pods that have a measurement of 45 to 61 mm. this machine can brew up to 12 ounces of coffee. 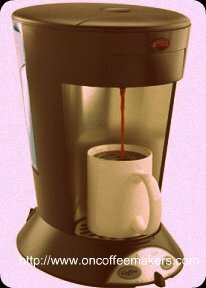 Other features of My Café brewer are as follows: it has a stainless steel heating tank that uses thermostat; it has a patented sprayhead, volume control for adjusting the coffee strength, pulse-brew technology, pod brewer, and has a water reservoir that can hold up to 46 ounces of water. Bunnomatic has these four models that are very popular. So, whether you prefer a 12 cup coffee brewer, having one of these four models is definitely the right decision for you to make. Not looking for bunnomatic coffee maker, but would want to know more about cuisinart, go to our homepage and read more about cuisinart coffee machines then..